Above: Rindt's non-fatal crash in 1969. Photographer unknown. Source. This past week was the 40th anniversary of the death of Jochen Rindt, the only posthumous Formula 1 World Champion. Rindt was a singular talent who, like many other unique drivers, did not survive the very dangerous sport of Formula 1 racing. Up until very recently many extremely gifted drivers in this category fell victim to the risks associated with driving cars that went like missiles but were built to be very light, with a compromise made on the security front. No cars were more famous for their extreme speed at the expense of safety than those built by Colin Chapman at Lotus. Whilst Chapman - and Team Lotus - are viewed with reverence in the world of motor racing, many of his creations were dangerously inconsistent in their build quality. This was a direct result of Chapman's uncompromising quest for speed and agility at a lower budget than factory backed teams such as Ferrari. Rindt, who had been driving for Lotus for a couple of years both in Formula 1 and Formula 2 races, was expected to be close in the title fight for the championship in 1970, after doing some exceptional driving the year before. Everyone knew Chapman's latest design, the Lotus 72, would be bloody quick that year, and with Rindt behind the wheel all Team Lotus needed to do was guarantee the cars reached the finish line. They did not manage a good result for the first 2 races, with a retirement at the Spanish GP. By the Italian GP, however, Rindt had already won 5 of that year's 10 races and held a comfortable championship lead. He decided, during the early practice sessions in Italy, to run his car without the extra aerodynamic wings that create downforce and aid the car's handling, despite some worry that the car would not handle well. This is a relatively common strategy in Monza, since it is a quick circuit and running with low downforce makes the car faster. During Saturday practice there was a failure on Rindt's car just before braking into one of the corners. He swerved violently to the left and crashed into a poorly installed barrier, killing him instantly. He had built a strong enough points lead, however, that he still managed to become World Champion since none of the other contenders managed to score enough points in the remaining races to take the #1 spot. This meant that he would become the first and only posthumous world champion. 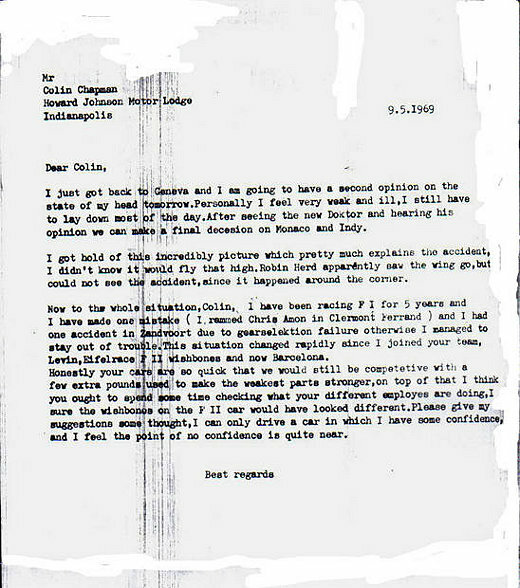 The letter below is from 1969, his first year driving for Team Lotus. 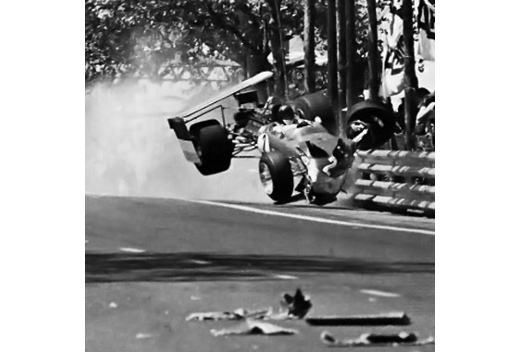 He had had a terrible accident at Montjuic, Barcelona, where the rudimentary wing system on his Lotus 49 collapsed and caused him to crash quite heavily. He survived but was injured and understandably shaken. Most importantly he began to lose confidence in Chapman's car, if only for just a moment. It is an eerie predictor of what would come almost a year later, and 40 years ago. Transcript follows. The above introduction was written by Mario Carneiro Neto. Enormous thanks Mario. I just got back to Geneva and I am going to have a second opinion on the state of my head tomorrow. Personally I feel very weak and ill, I still have to lay down most of the day. After seeing the new Doktor and hearing his opinion we can make a final decesion on Monaco and Indy. I got hold of this incredibly picture which pretty much explains the accident, I didn't know it would fly that high. Robin Herd apparently saw the wing go, but could not see the accident, since it happened around the corner. Now to the whole situation, Colin. I have been racing F1 for 5 years and I have made one mistake (I rammed Chris Amon in Clermont Ferrand) and I had one accident in Zandvoort due to gearselektion failure otherwise I managed to stay out of trouble. This situation changed rapidly since I joined your team, Levin, Eifelrace F2 wishbones and now Barcelona. Honestly your cars are so quick that we would still be competitive with a few extra pounds used to make the weakest parts stronger, on top of that I think you ought to spend some time checking what your different employes are doing, I sure the wishbones on the F2 car would have looked different. Please give my suggestions some thought, I can only drive a car in which I have some confidence, and I feel the point of no confidence is quite near.